The Communications Bureau is the heart of the police department. It is open 24 hours a day, all year long and handles all the police radio traffic and all of the incoming 9-1-1 calls for service. Dispatch can be contacted for emergencies or for crimes in progress by dialing 9-1-1. 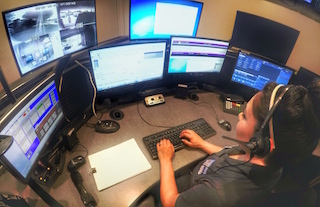 In addition to answering calls for assistance from the public, our dispatchers monitor and maintain communications with the officers in the field, as well as other law enforcement agencies. Dispatcher / clerks also conduct computer inquiries for ourpolice officers such as warrant checks, criminal history, and vehicle record checks.